After I posted "Tropic of Thetis" it was suggested that a night version might include some bio-luminescence in the water. This is my third version of the night scene. In the earlier versions(available in the Pickle Jar) I played around with the brightness of the clouds and the amount of haze. This version is more like the first, with the brighter clouds, a bit more haze, and the bio-luminescence shifted to the orange (away from pink). I've also added some 'glowing foam' in the surf. I would be interested to hear your feedback on that. My absolute favorite rendering since my dad first introduced me to DB in 2000. I love these planetscapes, they just make me want to visit these places. Fluorescent flora and an imponent gas giant in the background... What else can you ask for? This is the one that convinced me to sign up. It's a masterpiece. I LOVE THIS ONE. one tiny comment - the bio-lumo in tv nature films is sometimes a yellowy green?...anyway, what do i knowthis is as usual very UPLIFTING...My 'stick men' for some strange reason have been turned down by the Tate Modern Gallery in London !...perhaps they do have taste after all?!? This is my all-time favorite. I've been following your work since college (c. 1999)and landscapes like this put me in a great creative mindset. (An old favorite is still Skysong, the old one and the remake.) Thank you for bringing art into my technical world. I downloaded this and Tropic of Thesis (day) for my iPad2 and I get so many compliments on it. BEAUTIFUL! This one just took my breath away when I viewed it, absolutely Stunning. Thank you for your continued evolution as an artist! I agree the foam looks like glowing ice and not foam, but I still like it. Torn between pink and orange fires, either is fine. Prefer the lighter clouds. I like the fire where the land meets the sea. It helps set the water and the tress apart. It even makes the horizon a little forbidding. For some reason the 480x320 images on tropic of thetis night and ostereier2k11 are cropped incorrectly. You should fix and upload them again. Your watermark is still hidden by the default W7 taskbar. I don't know if you care, but if you do, you should do something. Have the original Tropic as my wallpaper - I love this too although, it is a little menacing in that it hints at the destruction of all true beauty. As a sculptor/artist,I bow down in awe to the genius of your tallent. Don't ever give it up!! This is one of my favorite images. I love the colors. When I was about to shutdown windows (when it turns the background black and white), I noticed how cool it looks this way too. Just sat there looking at it for a minute. Any way -- love the work! Keep at it! I think the foam is amazing! I like this one, but imho the fire is misplaced here. I generally like all the pics better, when they look a little out of this world and there are no real traces of humans. those fires look too much of human rituals to me. That foam turns it into *awesome*. I'm a fan of day pictures, and I loved the happy-tropic-brightness of the day version (kind of reminds me of the BioDome pic's brightness and cheeriness actually). But this night version has a certain pizazz and zing, thanks to the foam and bioluminescence. I'm with Kevin on this one (though I only have one widescreen) I do like it with the foam better. I rather like the foam found in the single screen shot. I think it adds a sense of motion and life that the non-foamy static cut-off version doesn't have. I would love to see it added to the multi-screen versions of this piece. I have actually worked on a program that does this for the past year, and I plan to open up beta testing for it shortly within the next month. This is actually going to be a commercial product, so I don't want to discuss too much on here (because I would be advertising without paying for it). The short version of the story is that it supports changing a wallpaper based on the time of day (such as a 8:00 AM or 5:00 PM), the sun position (such as sunrise, dawn, mid-morning, noon, mid-afternoon and dusk, plus others) and also the date (either a season or a specific date). Images can be displayed in various ways. You have the standard center, stretch, tile as well as fitting proportionally and filling proportionally. You can also specify a multi-monitor image and it will span it across multiple monitors. There is also a "collage" mode that will overlay images on top of other wallpapers. Another feature of this program is that you can change various properties of the image (such as hue, brightness, contrast, color balance, and other more advanced ones) based on the percentage of time elapsed for the said wallpaper group. You can also set these properties independent on the amount of time passed. That is the gist of it, though there is actually much more than that. The hardest part is actually finishing the GUI and making it look nice and functional.. as I have discovered about 90% of the coding for this project is just that. I will definitely keep you all posted on when this project is ready. If you want, I can post some edited screenshots. Discuss away. I'm interested to see what you come up with! Cool. I've found many [apps] that switch based on "# of minutes" from start-up/last switch, but none that switch based on the time of day. Since Ryan offers many day/night imagery it would be cool to have an app that does this. When done post on FB, please. Ryan maybe you could use/promote such an app. I know, the first version blew me away. Plus when you don't have anything to compare it to... I never paid much attention to the ratings on other projects throughout the versions. Might have to some time. Without going into too much detail, I might be able to help you with this in about a month. I think it might be rated lower for the same reason people don't like the Star Wars "Special Editions". Art's greatest impact is on first viewing. Revisions, while perhaps technically superior, do not have the same power. Wow, thought I was satisfied with the previous versions. This one is exactly what I wanted. Amazing job. I think you have hit the nail on the head in what sort of images your fans and members like best Ryan. Big improvement! Thanks and great work! "3200 x 1200 (dual 4:3) (split files) "
Great one, Ryan, I was hoping to grab the 3200 x 1200 (dual 4:3) (split files) and the split files link seems to have broke. "Tropic of Thetis - Night and Day"
I love how the ocean, beach, and trees remain in the exact spot on the screen, but the moons and clouds move. Gives it a "Real" perspective. Now if only I could get my computer to switch the images based on day / night time settings (like my GPS - okay that's a light sensor). "This wallpaper loves my 7680x1600"
Ryan, thanks for taking the time to make a 7680x1600 render. This is my favorite image so far!!!!! "Tropic of Thetis (Nightfall) (2011)"
Yup. About time to get a few more monitors. This is sick. I usually don't post comments but this one is just awesome!!! Was waiting for you to post a dual monitor version and it was worth the wait! This is linked to the triple 33x5040 image. The dual-screen 3360 x 1050 download of this is is actually a triple-screen (5040 x 1050). Any chance you could fix this? A sunset version would truly be awesome. Beautiful rendition of an imaginative exotic otherworld. Well done! "Reminds me of "The Quiet Earth""
Of the 2011 versions of "Tropic of Thetis", I like #3 best, although my favorite of this theme is the original "Thetis Moon" from 2007, that was a combination of "Thetis" and "Cancer"(?). It reminds me of the end of movie "The Quiet Earth". I am enthralled by your incredible and gorgeous scenes of Tropic of Thetis at day and night. Are you thinking of making a sunset scene? That would be awesome! Any of you star haters realize that you can see the stars through the visible rings, too? By that argument (and common sense), the stars behind the rings that are blacked out SHOULD be MORE visible than those behind visible rings because there is no dust--nothing--impeding their brightness...your lack of intelligence is really only a minor issue, though. that is my vote. Foam and clouds - too much going on. Maybe slightly toned down foam with the darker clouds. Pink or orange either way but I liked the pink better. thanks for the variations though! I like the orangey glow and the clouds look much better but I'd take out the foam. I really like this update, the foam too. I only prefer the "old" pink luminescence. REALLY REALLY want a dual screen of this one. Beautiful! "Not a fan of the foam..."
I can't really tell what the foam is, it ends up being a distraction that takes away from the calm edge of the water. Also, I'm not sure about that orange... I think the pink may have worked better, or maybe just a dimmer orange? I think version 2 was my favorite. Great work! "Make a dual screen version of this you bum!" Just kidding, you aren't a bum. But I would really like a dual screen version. Hopefully when you get your new PC setup the render times will get much faster. Keep up the great work. looks good, though i still like the original version best. I think this last version is the best so far. My only complain is the orange glow, it deviates too much from the color palette of this image, purple would have been a better choice. 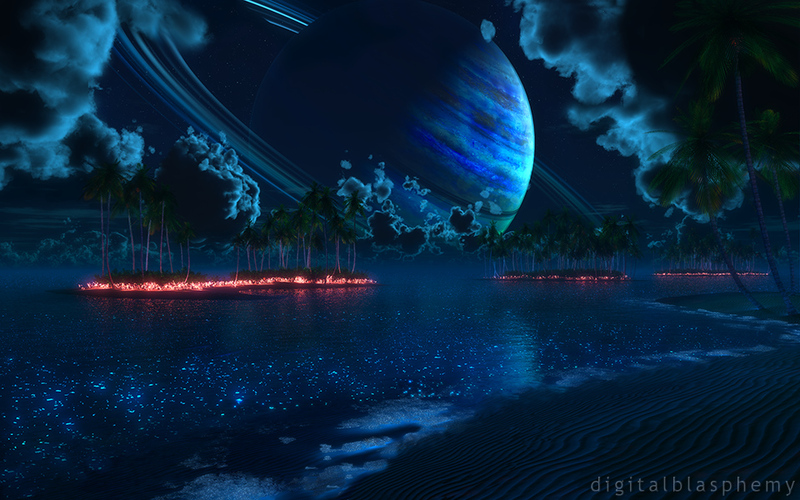 ""Tropic of Thetis (Nightfall) updated"
Very nice!!!! you always do awesome planetscapes. Love the glowing foam at the shoreline. "One of the finer pieces you have done." And that is saying a lot: you have many great works under your belt. "Tone down the foam a little and..."
add more bioluminescence where the dolphins are swimming, you might be able to highlight them a little. The Foam is cool, but it seems too bright, maybe tone it down to the dimmer foam that is a little further out. Not sure about the Orange, it's cool, but other colors might look cooler. All In All I really like it, you've kept the best parts of the first 2 and made it better. I still think the island plants should be a darker color, more greens, blues, or purples, or even a mix to tone down the sharp contrast in colors, less of a shock to the eyes (mine at least). Wouldn't the viewpoint island have the red glow too? The clouds are hands-down the best part of this image. Could do without the foam, it looks a bit odd, like you can't tell whats its suppose to be. "Tropic of Thetis (Nightfall) 3"
YOU Really should try more exotic colors! Definitely! about that foam... very interesting idea.. but it does not seem foam to! to me it seems glowish ice of some sort..! at least at small res it does not seem foam! PS: nice to see the clouds with less stormy looks! I seriously don't like the bright clouds and I actually think the pink looks much better here than the orange. I like the glowing foam, though. Can't we get #2 with the foam? That would be the best in my opinion. Waitin' on the double-screen version, to become my new favorite wallpaper. "Glowing foam makes me roam!" I love the glowing foam; I always thought that area looked a bit barren. I love the enhanced clouds and haze, too. I don't like the orange bioluminescent glow as much as the pink; I would have preferred blue, purple, or green. But it's a wonderful render all the same! If Jakob is talking about this render, I'm not in favor of adding Earth-specific monuments or recognizable features unless they fit the tropical theme. Ayers Rock is in Central Australia; Mount Rushmore is in South Dakota. Both would be out of place. Phang Nga Bay is in Thailand, is tropical, and does have palms, though mangroves are more prevalent. Anyway, Ryan's own creations are far better than recognizable Earth features, IMHO. I just love the latest update to your Tropic Of Thetis" Ryan. I think it's my favorite. I was wondering if it was possible to add a faint green glow to the leaves or do you think that would overshadow something else? I do love the fact that the clouds are highlighted again and I do love the glowing foam by the shore. Keep up the good work!! Great stuff Ryan, everything looks fantastic here. The only criticism I have is that if I hadn't been following this image since it's first post, the bioluminescent glow on the islands would seem like fire; which I don't necessarily mind. Simply fantastic, as are so many of your pictures. I simply love the otherworldly feel that the gas giant gives the picture. Might I suggest that you play around with the combination of elements that says "this is not earth" and elements that says the opposite? Dolphins in the water, with the gas giant in the sky is an excellent example. Maybe you could include some Earth specific monuments or recognizable feature in a future picture? (Ayers Rock, Phang-Nga Bay, Mount Rushmore or similar). Charlie Sheen would be proud, this image truly has tiger blood running in its veins now. Beautiful edits to this image, it is now in my top 5 all time images. Love the orange over pink. Oh, AND, the GLOWING FOAM just adds an amazing, realistic, demarcation to the edge of the water as it laps onto shore. I love that you brought the glow back for the clouds. The additional lighting near the shore really brings the whole scene together. This image gets better with every revision! This is the best yet. YES!!!! "Tropic of Thetis (Nightfall) (2011) Up-Dated...WOW!!!!!!!!!" Ryan, The detail on the latest rendering on "Tropic of Thetis - Nightfall is amazing! I await eagerly to see what you will share with us next. I love the update to the clouds and even prefer the orange to the pink. Personally however, I could do without the "glowing foam" at the shoreline. I find it distracting more than complimentary. Keep up the sensational work! I've posted an update this morning that resets the cloud brightness and shifts the "bio-glow" more to the orange (away from pink). I've also added some "glowing foam" at the shoreline that I would be interested to hear your thoughts on. The multiscreens are rendering now and should be up shortly! The triple-screen version is rendering now! Do you plan on making a triple screen version of this wallpaper? I'm glad the dophins are back (or a bit easier to spot? ), though a bit extra bio-luminescence from their wake would be cool. The clouds definitely were better on the first version, though the haze beyond the islands works. I like the light reflecting through the clouds, it makes it feel more magical or something. Overall I just like it better. Ty for the great work, just my oppinion. Why the iPhone 4 version still include the old watermark with .com? "How about toning it down a tad? Or even better, a toned down purple?" "I like the revisions but miss the illuminated clouds." I like the detail of the glowing stuff in the water compared to the original (pickle jar version). I like the trees too. I miss the illuminated clouds though. For some reason the dark clouds remind me of the smoke monster from LOST. :-) I also think a pickle jar version with purple or green bio-luminescence on the island would be nice instead of the pink. Overall my favorite wallpaper! Spectacular work! Joel says: "Maybe also the shore of the island to the right should have a little of bio-luminescence." I agree, but also think it's a bit bright. How about toning it down a tad? Or even better, a toned down purple? I also like the darker clouds and the new watermark. The www and the .com aren't needed. You'd only need more if you were .net or .org, etc. Overall, I love this render! "Pink - Rings - Watermark"
That's what I'm talking about. Or purple, yeh. "For those who don't like the pink..."
Ryan, if it's not okay to do this, let me know and I'll remove it right away. I still like the original a lot, but I like the improvement to the trees in this one far more. I did prefer the original clouds, but will take the newer trees over those clouds. One of your best wallpapers. The only thing I wonder about is how long night lasts... Does it last long enough to have a coat of frost before dawn comes around again? This version has been my favorite piece of yours so far this year. I understand the rings are shadowed and thats why they are missing in the back, but I think the problem is that it disappears to sharp and suddenly, doesn't look natural. Would look better if they faded away more. I forgot to mention the watermark. I like it better without the dot com. It seems more professional, more like a work of art without it. I like the original better. The brighter clouds made for a more interesting piece. The darker clouds just get lost in the background. I understand what's going on with the shadowed rings, but it just doesn't look right for them to be missing entirely in that area. I could do without the pink. Maybe if it was toned down a bit it would be okay. I'd prefer a green, yellow or blue I think though. Criticism aside, the original is still one of my favorite wallpapers you've done. It's second only to Beginning of the End. I think the new watermark is fine, most people already remove the "www" with a lot of browsers not even requiring now and most will assume its a .com. I think the original version is better, especially fot the clouds luminance! The darker clouds look great, now the attention is concentrated on plant and bio-luminescence. Maybe also the shore of the island to the right should have a little of bio-luminescence. I don't like the rings of planet that look incomplete. Like others have said...Whats up with the rings :(? The new clouds look great, the volumetrics on the left clouds look awesome. Also just a suggestion, maybe you could put a couple of the pink things on the shore to the right of the camera? That way we could get a bit of a feeling for what they actually look like up close. i'm really gonna miss the .com extension... is there any point in asking you to put it back in there? I actually like this newer version better. Compared to the one with the "shiny" clouds, the lack of them allows one to focus more on the fore and backgrounds instead of the clouds. Yay. Also aaaaah at .com being removed from the watermark... that's gonna take some getting used to! "I liked the shiny clouds better"
With a light source that large in the sky, clouds might very well be as shiny as they were in the first render. First thing I noticed that the rings behind the shadow of the planet do not exist and stars that should be hidden are poking out. Other than that, this is fabulous! First of all, amazing image! This is honestly one of my favorites in years (and that's really saying something considering the quality of work you usually put out). That said, I'm wondering if there's a rendering bug or something that's causing the top left of the planet's rings to just abruptly disappear. Conceivably, it could be the planet's shadow, especially considering the light source position... but it looks extremely odd. Especially since it's totally transparent (unlike the rest of the ring). I'd add another (very dim) light source the the backside of the planet (on that layer only) to slightly illuminate the back end of the ring. I love the update. I definitely like the darker clouds better; it looks calmer and I can appreciate the rest of the image more. It looks truly like nightfall now. And I don't find the pink annoying at all; I actually think it goes very well with the rest of the image (and I'm not usually a big fan of pink). "you can definetly pull better colours on this one Ryan!" i like the other one better! why? 2-the haze is fine... but.. limits that horizon freedom feeling! i like horizons... don't you? 3-about that pink glow on he islands plants..
THO you can definitely try other colors! hell... try the hole rainbow and see what is better! 4-the planets ring's are invisible by the planets shadow? ok! never the less this scenario IS probably the best night scenario from the last years! IF you tweak it a bit further... it can turn out to be the best ever! PS: I like the new title...but, I never disliked the old title. I've never found your "signature" block distracting. Perhaps the fish should have a red/pink tint to them and give the plants a green/yellow tint? Agree with Nightwynd, I would love this image if the GARISH pink Christmas lights were not present or were of a different color. The pink looks too forced and artificial...Green or yellow-green would look gorgeous. As for the watermark, it looks good, but I tend to agree with Mike. It's even lovelier with the changes you DID make....but it still looks like it should be a Holiday Image with all the pink Christmas lights. Is there anyway to get it without the garish pink Christmas lights??? Otherwise, its beautiful. Allright, I'll come out of perpetual lurking to say that I'm floored by the night version. I've stuck it on a new Mac, added some dark themed icons to the few items allowed to live on the desktop... the result is just gorgeous. I like it without the .com, as you said it looks more like a signature and less like an add. That was sort of my intention. With the ".com" I think it looked more like an ad. I wanted something that would work as a signature (a visible name that people could google) but not look like I was putting a banner ad on your desktop. I would love to hear other Members thoughts on this! I don't know why, but the new watermark looks so strange without the '.com' For some reason it looks less professional to me. I think you should stick with the old one. I must concur with Scarr. While the rings would be pretty much invisible cast in shadow like that, if you look closely you can see the stars where the rings should have been blocking them out. It's a little bit weird. That being said, this is definitely one of the coolest night time wallpapers I've see from you to date. I love the use of the bioluminesence, though I'm a bit surprised you didn't give something(green, perhaps) to the fish you have hidden right under the surface there. All in all, well done. 8.5/10.0 from me(9.0 if you get the shadow thing fixed). will we be getting future (and past?) wallpapers for the playbook? I like the fact that the islands are more visible now. However, I think I like the clouds from the first render better. It just goes with the whole bioluminescence feel to me. I've added my second revision of this morning. As the first version turned out to be pretty popular I decided to leave off making any huge changes. The clouds are a bit darker here and I've added some have to make the islands a little more visible. Thanks for all the great feedback folks! Multiscreens are rendering now! @Scarr` the rings are in the shadow of the planet, I think it looks awesome. This is one of my favourites! Well actually, the way I see it, Avatar stole *many* ideas from you. I do believe you should hit up James Cameron for royalties :) Anyway, keep up the great work! This looks great! I love the little sparkles of light in the water near the beach. I will download the hi-rez version as soon as you post it. "Lay the revision on us"
Hi Ryan. I always love your revisions. I don't if if something can be better then the best, if it can be, your work defines it. Simply stunning. The best you've made, in my opinion (knocks highland spring off its perch). Don't be shy about revising though - if you think you can improve on it, go for it. Was looking for a wallpaper to replace my winter one (At World's Edge) and didn't have to look far. Just beautiful! Excellent. Love the way the islands glow and the beach has a faint glow also. Hey, I've noticed the planet rings as well in the upper left corner just seem to cut off. It COULD look like a shadow, but I think the rings would still vaguely be there, at least. Was this a mistake? Or am I missing something.. Excellent cloudwork again. Your art is amazing! This picture has unbelievable color and quality. Good job! It's beautiful, but I would like the pink christmas lights not be in it. The bioluminescence on the water is perfect, but not the pink christmas lights. Just me. Magnificent work Ryan. I usually don't leave comments, but I had to tell you that this is now my favorite wallpaper. It is very magicial and I like everything about it. I like the day version too but there's something about glowing light in the darkness that I just love. Great job! Kana - Are you talking about the line in the upper left? If yes, I think that is where the planet's shadow begins. The clouds above the line could be "outside" of the shadow. This is an awesome one, Ryan. I've been a member for a few years and don't comment often...but I really like this one. I am continually struck by the quality of your artwork compared to others out there. Can't wait for the dual monitor version, I love this. Ryan, you've outdone yourself yet again. I like both versions, but I have to say the night version has its own special kind of magic. Well Done! Four stars! Thanks Ryan, haven't commented in a while, busy. But, I just couldn't not this time. I live on (or near I should say) Lake Superior. Obviously not the tropics, But, during what we fondly like to call Summer, we do get to enjoy some great moments. You've captured the tranquility of those moments. Thanks again. You are a genius, that's all I can say. I did notice that after I posted originally, that in the lefthand side of the picture, there is a very clear line that cuts off a block of the rings, for no apparent reason. Were there supposed to be clouds there? Or a glitch in rendering? It's very odd to me, doesn't look right. "Please post multiscreens ASAP! LOVE IT!!" I think this has to be my favorite piece you've done, and that says a LOT because you've done some amazing work! I have a dual-widescreen monitor setup and CANNOT WAIT until you post the multiscreen version of this! This will DEFINITELY be my new wallpaper! Please post multiscreen ASAP! Keep up the good work! I absolutely love this. Your best yet, in my opinion. I sat and stared at this for like 5 minutes when I first opened the file. I have to say that I'm tempted to say this is better than Beginning of the End which has been my favorite by you since you conceived it in pixels. And as a writer it has actually inspired a few story ideas. Truly remarkable vista! Even better than the original, I would love to be there! I have to say I think the Planet and the sky is the real eye opener of this piece, not a big fan of the beach. But nevertheless, wow! One of the most beautiful pics in a while!!! I simply love the night version and great idea with the small lights on the islands!! Hi Ryan.. Just amazing work. May I ask what the pink lights are ? Are they luminescent plants ? This has taken my breath away. Thanks..
Ryan, seriously... this is some of your best work. You know I've never said that lightly, but damn, dude. I've always thought Thetis was one of your best, and in recent years it's been almost even with Fluorescence as my personal favourite. I honestly think this puts it over the top, and it's the bioluminescence that sealed the deal for me. Would you consider experimenting more with this effect, now that technology has caught up with your talent? I'm thinking jellyfish or some kind of spacescape or abstract that really uses this technique to its full potential. I really hope you experiment more with the bioluminescence thing, but regardless I'm happy you came back to Thetis and that you're continuing the series. You have no idea how excited I was about this, but yet again you've surpassed my wildest dreams. "this is now my wallpaper"
Sorry to nitpick, but here are a few thoughts..
First impression: the surface of the planet looks like a painting. Of course it might be "natural" for it, it is an alien planet after all. The angle of illumination on the gas giant and the apparently "night" scene on the moon does not jibe. It should be just after sunset and still quite bright..
the illumination on the planet, the position of the rings and the shadow of the ring on the planet do not agree with each other. I suppose the clouds are meant to be illuminated from the light reflected from the planet, but it looks wrong..
Then again, if all the light effects arose naturally from your render, then I have nothing to say..
One more thing, the ridges in the sand at the water's edge should be partially washed out by the waves..
"I forgot to add - "
"Adore it all - except...."
I am absolutely in love with this. It's gorgeous. But the pink draws the eye immediately and (I think) takes away from the overall peaceful atmosphere of the image. Maybe green or purple or some other cool-type color would be more balanced. But still a stunning piece. <3 it! "So glad I found your artwork years ago!" Ooooooo. :O It looks so magical. My favorite this year. Nice work Ryan! Wow. Just wow. So many good things here... Gonna say again how much I like the backlit clouds (like in The Fisherman). This is absolutely brilliant. So beautiful, relaxing.. this one really does take you away. Thanks Ryan, as always. Wonderful!!! This has to be one of your best! I read this as a late sunset picture, with the sun on the right side, still illuminating the planet in the sky and giving a "moonlight" effect on the clouds and the water in addition to the bioluminescence. And I don't usually like the sci-fi ones as much as the abstracts. I think it works because it the pink IS so bright and unreal. I'm really liking this. As has been suggested by others, I think the plant/island bio-luminescence needs to be toned down a little, or the color changed. It looks too striking compared to the rest of the scene. Love how the water bio-luminescence turned out! And the planet is fantastic. I think I go here every night in my sleep! One of your very best! "Yeah ! Exactly what i love from you - THANKS :-)"
Bioluminesence is just amazing. Love it. Can't wait for the dual & triple screen versions! Awesome! I have always loved the Thetis wallpapers. This is my new favorite. As soon as this one goes multi-screen, I have found my new favorite wallpaper. My only complaint is that the one small cloud that overlaps the top right part of the planet bothers me, but aside from that one small thing, this is already one of my favorite of your works! I have to disagree with others who don't care for the bio-luminescence; it *is* an alien planet, after all. :-) Since I have all of your wallpapers currently rotating on my desktop, I'm using this one as the background on my Windows 7 login screen. Well done! First the good: The bioluminescence in the water is amazing. I like the clouds, the planet, and how the luminescence illuminates the trees. I assume you are going to add a little foaminess where the water meets the beach, like you did on the day version? Also I'll echo the comments about the pink intensity being turned down just a tad. I am curious where the light source is - it looks like the clouds on the left are illuminated on the right, and vice versa? It's hard to tell. This would mean the light source is in the middle, perhaps it's the planet? Nitpicks aside, I can't wait to see the final render. This could be one of your best. Amazing, Amazing, Amazing! Tropic of Thetis (Nightfall) Is a Homerun! I believe that your artwork will be remembered for generations to come! I can hardly wait to see whats next. As most ppl here have said, this looks amazing. Easily one of my top 10. Can't wait to see what you have planned next. I don't see it getting much better than this. Maybe I'll cancel my subscription now. A beautiful combination of "Tropic of Thetis" and "Tropical Moon", two of my favorites. These are the images that keep me coming back to your sight day after day Ryan. I really love this one. I think the pink flowers or whatever that is on the island in the back really adds to the mood, and makes the scene more beautiful in such a dark world. I wish I was able to rate this an "11". This is my ALL-TIME favorite! I wasn't one of those who asked for the night version, but I did wish for it, so thank you! Stunning. "Tropic of Thetis (Nightfall) "
Dunno about the pink glow. ALmost looks like a brush fire. "Absolutely Great. Love your night scenes.."
I think Kana hit the nail on the head. 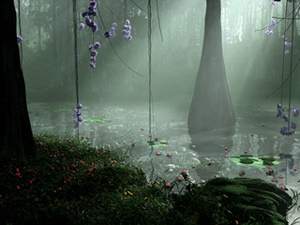 Bioluminescent flowers need thinning out and maybe change color of them to a dark purple. Then it would be absolutely perfect. The cloud banding on the gas giant looks just a bit too regular and stands out a bit much compared to the daytime version. On the top right hand edge of the gas giant it kind of looks like there's a thin (Earth-like) atmosphere which is physically wrong because it's a gas giant so it's all atmosphere. Also, for the planet to be close enough to its sun for the moon to be habitable, there should be a lot more light reflecting off the planet and lighting up the moon at night. I wouldn't usually be so picky with the last point, but I coincidentally happened to calculate just how much light would be reflected the other day. 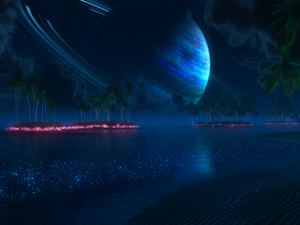 ""Tropic of Thetis (Nightfall) (2011)""
Love it, except for the pink lights other than that it's beautiful. Looks to me like there are a few too many clouds out towards the horizon, but otherwise looks great! Multiscreen! Very nice addition to your collection! For your tweaks, a few suggestions. Your clouds in the center, in front of the planet, seem a bit blocky to me - they lack a bit of definition as opposed to the clouds on the sides. Your bioluminescent flowers out of the water - instead of a bright pink, I would either do a bit more sparse flowers, or I would tone it down to a light purple or something like it, so there's not such a massively sharp contrast in colors. It seems almost too glaring for me - that's my opinion, anyways. I have always been a fan of your night scenes but this is by far the best that I have seen in a while. Keep up the good work. Looks like the islands just popped up from an underground volcanic vent. Maybe localize them a bit more in pools near the islands? Otherwise, I'm in awe. The planet and the water are truly some of your best work yet. So excited to set it as my desktop! Awesome! Excellent first stab. I'm looking forward to the even better version coming up. I love the combination of night with sparkly lights. Please render a dual monitor version. It is torture seeing your new creations and then not being able to enjoy they immediately on my dual monitors at work. Keep up the great work. 10/10 on this one ryan, absolutely incredible, wouldn't change a thing ! Please, a dual/triple monitor render would be amazing. Hope you can get it soon! This is good.....more of this. Night time + lights = awesome. Is that sunlight on the gas giant? If so, wouldnt this scene also be lit by the sun? as soon as i get to work..
and have much more possibilities i'll make a 4 digit donation to you Ryan! wish i could make it right now to help on your new workstation cause you deserve it! you make my pc's desktop beautiful! You have outdone yourself, sir! i do really like the clouds! Holy OMG if this isn't dual screened like right now, i'm gonna go ape **** crazy! The clouds will definitely be darker in the next version. The bio-luminescence in the water is almost looks like the Pandora at night from the movie "Avatar"...Great Job! Ryan, I thought your original version of this render was great, but with the last two versions it is nothing short of spectacular!! This is absolutely amazing my friend. I've been a longtime fan/member of the site and have wanted to comment numerous times, but this piece of work pushed to me the breaking point and I instantly had to comment (I've not even downloaded it yet)!!! This is simply magical... exquisite... serene... I just love it man!!! This is absolutely fantastic. I love this as much as the night version. Can't wait for a dualscreen render!! @Miguell026, +1. Well said sir, well said. One of Ryan's all time best IMHO. Leave it just as it is (Red lights and all). 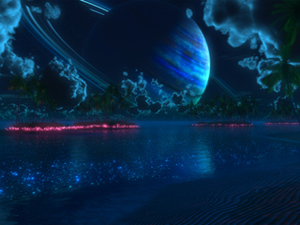 I absolutely adore the bio-luminescence in the water and that planet looks fantastic! But the red lights around the islands add a bit too much activity. THIS... is WHY i am a Lifetime member of DigitalBlasphemy and a 11 year old fan of Ryan's work! im rating this a 10 (best)!! All I can say this is SWEEEEEEEEEEEETTTTT!!! Dang, you beat me to first post! I agree 1000% that this smashes the day version. In fact, I find it outrageous. What else is up your sleeve Ryan?! WOW. This is 13434264346t532452351321235 times better than the day version.